In his new series of metaphoric paintings, Emmanuel Dudu sets the sport of boxing as a backdrop for daily life in Nigeria today, including its challenges, rules, and social order. a backdrop for daily life in Nigeria today, including its challenges, rules, and social order. 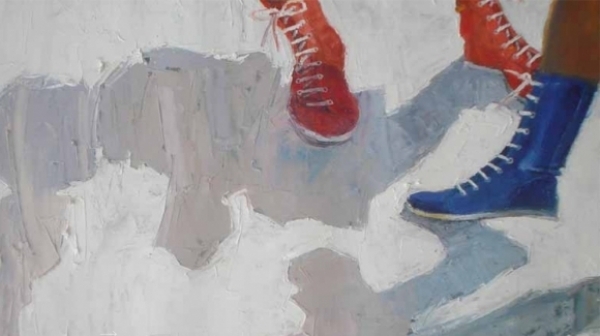 Depicting two players in combat with the simple use of shadows and fragmented body parts, his paintings border between the figurative and the abstract as he compares the game to the representation of society as a whole. As the viewer becomes the active audience in the boxing “theatre,” Dudu calls into question dynamics of spectatorship, identity, deceit, spirituality, and role-play. Even as these players live to fight another day, in the end the line between winning and losing is blurred. Dudu captures the game in action, as a process and a continual dialectic. Emmanuel Dudu is a painter and mixed media artist whose work comments on daily life and routine aspects of traditional and contemporary society in Nigeria. Dudu obtained his Bachelor’s Degree in Studio Art from the University of Lagos in 2008 and he is currently in a Master’s programme in Art History at the University of Lagos. Dudu has credited over thirty group exhibitions, including the National Museum, Pan African University, The Civic Centre, Nike Art Gallery, and Terrakulture, among others. Dudu was First Prize Winner for “Spain Through Nigerian Eyes”, an art competition organized by the Spanish embassy in 2006. He also was a winner of the National Art Competition in 2008, with a travelling exhibition in Lagos, Abuja, and Amsterdam, and he was a finalist in the National Art Competition in 2012. Dudu lives and works in Lagos.